CO-OPERTITION is a conjunction of cooperation and competition and calls for four-team alliances whose robots worked the field cooperatively to maximize a score we all share at the end of the match. No defense, just cooperation. The competition is composed of two phases: Qualification Matches and Elimination Matches. Teams will be paired together to form alliances. An alliance will work together to try to win a match. Alliances will win or loose as a single unit, and any points and/or victories will apply equally to both teams within an alliance. During qualification matches, alliances will be formed just prior to the start of each match, and will last only for the duration of that match. Thus, teams that will be allies in one match may be opponents in another upcoming match. All teams will play an equal number of qualification matches. Following the conclusion of qualification matches, the cumulative results of each team�s qualification matches will be used to rank the teams. The eight highest ranked teams at each Regional event, sixteen teams at the National Championship, qualify to move on to the elimination matches. Prior to the start of elimination matches, each of the top eight qualifying teams at any one of the Regional Events and top sixteen at the National Championship, will select an ally from the remaining teams. If one of the top seeds selects another seeded team as an alliance partner, the team with the next highest qualifying points becomes seeded until all alliances have been formed. Once these alliances have been formed, each of them will again pick from the remaining teams, a third to serve as their alternate alliance partner. The alliances formed at this stage will stay together for the remainder of the elimination matches, which will be a best 2-of-3 series to determine the winning alliance. 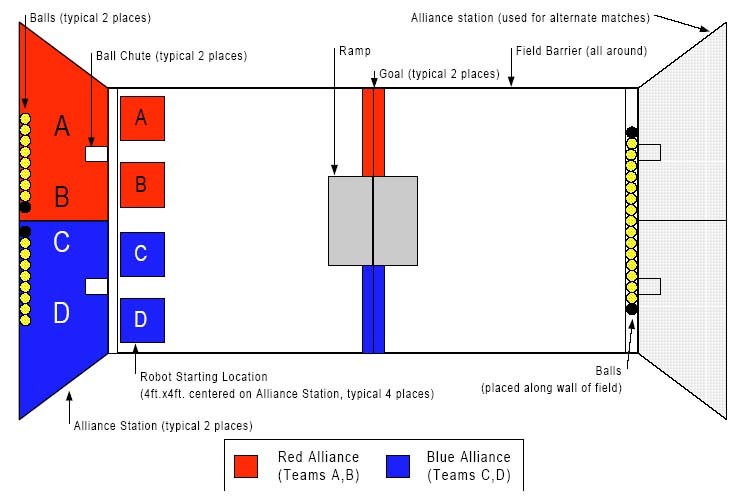 During a match, each alliance scores points by placing balls in their goal, and by positioning their robots in designated areas at the end of each match. Each alliance will compete using two (2) team-built robots, four (4) robot operators, two (2) human players, and four (4) coaches. The �Ball� is a textured rubber playground ball that is approximately 13-inches in diameter. There are two 6-foot high, fixed goal structures located mid-field. Each alliance has its own color coded goal. Under each goal is a 30-inch high clearance bar, which robots may pass under to access the opposite end of the field. Connecting the two goals in the center of the field is an 8-foot wide carpeted ramp, which the robots may also use to access the opposite end of the field. This section has a 5-foot high clearance bar that robots may hang from to acquire points. At the end of a match, robot position on the ramp may also generate additional points. Information on construction of the playing field and ramp are included in the field parts list documentation which is supplied with the manual at the Kick-Off Workshop. The robots will compete within the bounds of the playing field, while the human players will be located at stations just outside the playing field. 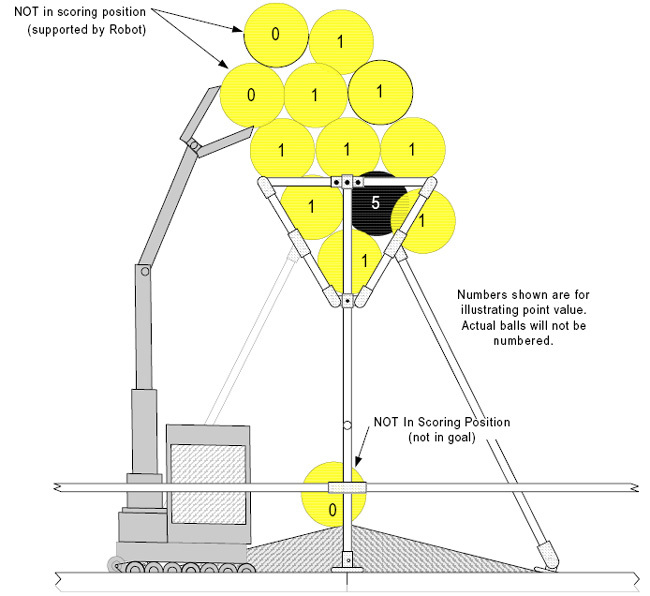 Only human players and robots may score points with the balls. Each match will last two minutes. In order to win a match, an alliance must score more points than the other alliance. At the start of each match, each alliance station will contain seven (7) yellow balls and one (1) black ball. Fifteen (15) yellow balls and two (2) black balls will be located at the far end of the playing field. All balls may be used to score points by either alliance. At the end of each two-minute match, points will be awarded to alliances based on the criteria outlined below. Each alliance will receive one (1) point for each yellow ball, and five (5) points for each black ball in the goal, and not in contact with or supported by your robot. All balls in scoring position cannot be in contact with or supported by your robot. If another alliance robot is in contact with your ball, it will not count against you. Each alliance will receive five (5) points for each of its robots that are completely �on� the ramp. 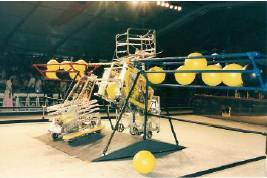 Each alliance will receive ten (10) points for each robot �hanging� from the horizontal bar connecting the two goals. A robot being held by its alliance partner off the carpeted playing field surface is worth an additional 10 points. During the qualification matches, all teams accumulate Qualification Points (QPs) which will later be used to help rank the teams. For a given match, each team in the winning alliance receives triple the match score of the losing alliance in QPs. Each team in the losing alliance receives their match score in QPs. At the conclusion of the qualification matches, the teams will be ranked according to total QPs accumulated. 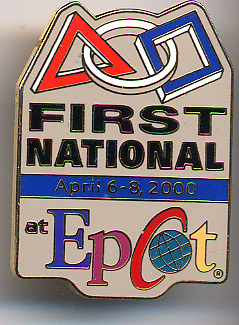 24 Teams (.pdf, 27KB) attended the inaugural 2000 SBPLI LI Regional. 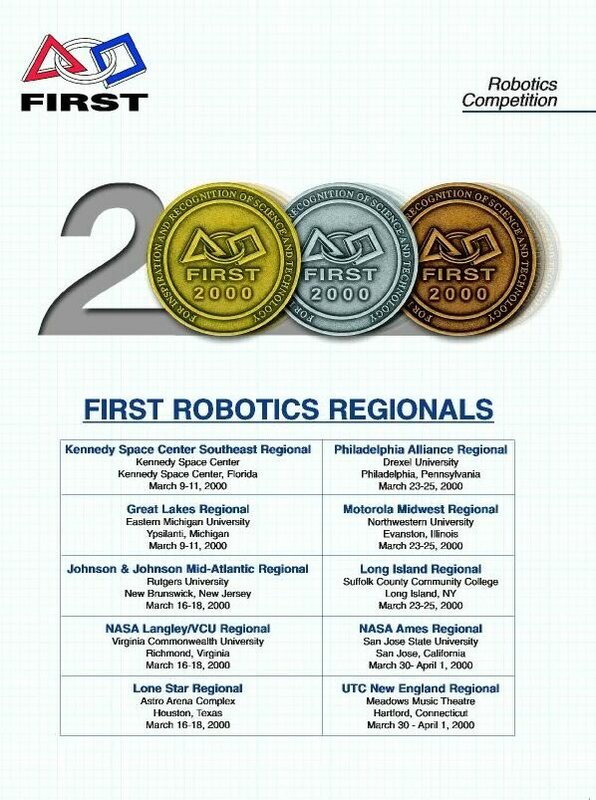 373 Teams (.pdf, 151KB) competed in the 2000 FIRST season at 10 Regional events.